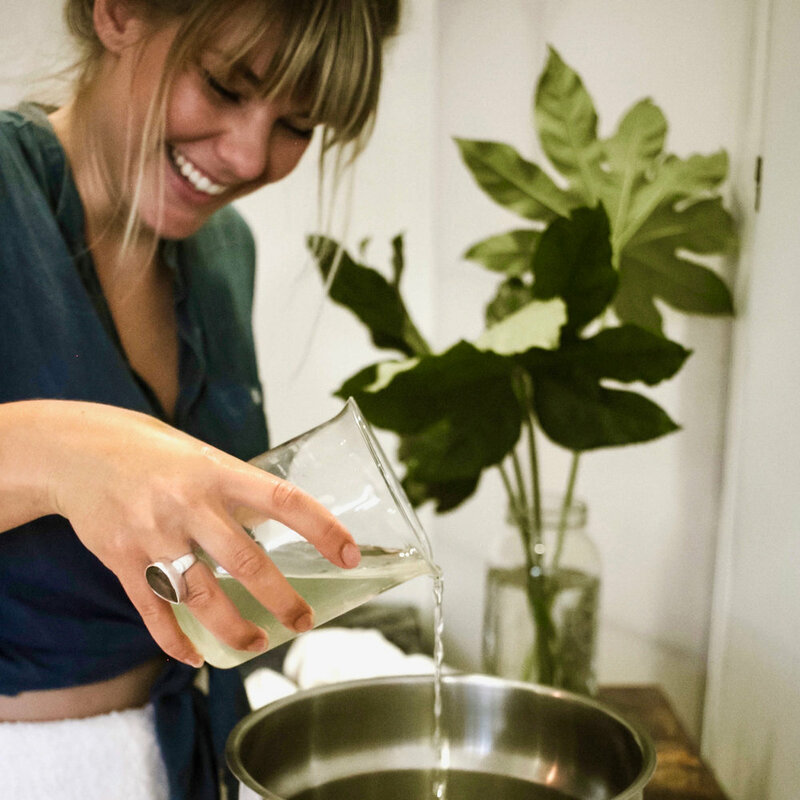 It is with sincere gratitude that I share my vision with you… a desire to create skincare products and beauty rituals that embody ultimate health, self-love, sustainability, and reciprocity toward the planet. I believe in working in tandem with Mother Earth to inspire a new wave of empowered beauty and self-care based in plant medicine, holistic awareness, and celebration of authentic beauty in all its variances. Thank you for joining me on my quest! Those early days spent in my botanical kitchen, experimenting and creating my first formulas, was like coming home. The craft felt natural and familiar, as my research continually affirmed my intuitive herbal hunches. And when I used these tonics, with reverence for all the pure plant energy contained within, my skin transformed. The acne I’d suffered from for years cleared up beautifully, my skin was softer and brighter than it had been in years. Each day began and ended with a botanical ritual that returned me, with glowing gratitude, to my earthly vessel. I had to share. Before long, I opened the EarthTonics Spa, a sanctuary dedicated to holistic skin therapy. I tempered my traditional esthetician training with courses in herbalism, aromatherapy, taoist yoga and energy medicine. I realized that conventional skincare and spa treatments functioned primarily by creating a “wound response,” in other words, by causing injury to the skin in order to stimulate healing. I felt there was a better way, and I dedicated myself to discovering and offering treatments that honored the integrity of our whole body, using whole plant ingredients and energetic modalities-- both ancient and state-of-the-art-- to elicit powerful rejuvenation without causing harm. As I had hoped, my clients expressed a deep sense of nourishment and relaxation, with a youthful rosy glow to boot. My work is truly fulfilling. Every day provides the opportunity to witness transformation, as we learn to treat ourselves with intentional healing touch and Mother Nature’s plant medicines. It’s my mission to deepen my understanding of holistic wellness, using the skin as a guide, and to share my discoveries as I explore what brings forth true radiant beauty in our being. From the bottom of my heart, thank you for supporting these creations. I hope you take as much pleasure in using these products as I do in making them.